Monday January 21, 2019 ……We had a great week last week both float fishing and wade fishing. Lots of fish were caught, and the unsettled weather that seemingly is ours now almost everyday we’ve fished right through. Our last float was one of the best I have ever had in any month, and we put a lot of large fish in the boat. It was great. But now the cold of winter continues, and its going to be that way for a while til spring arrives. So what do you do about it? Fish on…..that’s what we’ll be doing…..
We had some really cold weather to start the week, and snow on a few days. Mid week I guided a float trip with my longtime client and fellow streamer junkie Ted Linczak, Summerville, SC, TN and met Ted on the upper South Holston. We decided to take advantage of the continued high but stable flows….as they normally produce great fishing if you know where, when, and how. Our full intent from start to finish was to throw big stuff on big rods, and we were met with the TVA schedule showing variable flows due to unit testing. So , we were unsure as to whether or not we’d have floatable water all day, as they were changing the schedule from one hour to the next. Turns out though we had good water all day and we had another bannner day of chucking meat. Some epic streamer eats, probably all total between three and four dozen including about a dozen or so large fish, picture worthy denizens ……. it was great, cold, breezy at times, and the damp chilly cold it feels like when its getting ready to snow. We had cloudy , low, gray skies all day…… which also worked perfectly too with our plan. We ended up at our takeout, as we usually do, right at dusk. It was a great day……plus had the river all to ourselves. At week’s end I did some wade fishing guiding Rick Allen, Archdale, NC. It was a very chilly day on the river, met Rick bright and early and we were on the river before 8am. It was frosty, the air was cold (20sF) and there was a characteristic nip in the air…..that felt like snow. While there was a slight chance of drizzle later and rain later in the evening, we didn’t expect snow. That’s exactly what we got. I keep telling folks you can’t trust a weather app on your phone, and that is why I don’t rely on them for forecasting. They are terrible. There was no mention of snow at all. But that is what we got. It snowed like crazy…..man do I love fishing in a snowstorm. And Im not kidding. It turns the fish on…. We fished double nymph rigs and caught a ton of fish, rainbows and browns, from the first stretch we waded. Probably three dozen fish and the last long deep green run we nymphed before breaking for lunch produced several quality fish, including the best fish of the day, an 18 to 19″ rainbow. We took a break for lunch and that is when the snow squall blew in. For over an hour it snowed about as hard as it can snow dumping several inches (3-4″ ?) in that length of time. We fished another long stretch and caught maybe a half dozen fish more before calling it a day at 4pm, ending in a shower of sleet. A 40 fish day, and got to fish in a surprise snow squall…..my favorite fishing for sure. I love fishing in the snow. Great day though, our last group of fish were all rainbows. We quit and then headed back to a car wash I use a lot and used the bay there to take our gear off. A cold weekend in the mtns also, we had bitter cold temps behind the front that brought the rain. Things changed quickly , a “flash freeze” where rain ends and everything quickly freezes up and high winds arrive and create an event of prolonged snow showers. “NW Flow” snow showers are what occur, and that is what went on and is going on this morning before it tapers off. What NW flow is is when we get a large potent low moving through dumping a large amount of rain. That is followed by a cold front behind it ushering in high winds, usually 25 to 35mph with gusts up to near hurricane strength (65mph>). When the NW winds start, and blow over the just saturated ground, it forces the moist air upslope . In our area, its a saturated East TN and Southwest VA that feeds this sort of thing. Moist air is forced upslope where the moisture content is magnified and the air is cooled further and it produces a prolonged light snow shower event that can pile up some impressive snows. This one won’t amount to more than 2 to3″ but the winds are fierce. One more day (Tuesday) of this and we are back to fishing. Winter weather isn’t an unusual or ‘Less productive’ time to fish….quite the contrary. Our last day out was really cold (Friday/Sat) and we put almost 50 fish in the net. Cold does NOT stop fishing. For Monday 1/21, I had scheduled a trip with Matt Baldwin, N Platte, WY, but we ended up postponing due to single digit temps in the mtns…will be rescheduling. In low temps such as that you can catch fish, and I have done it, many , many times, but you are cracking ice off the rod every three to five casts, and everything freezes up. Boots, boot strings (making it hard to get the waders off), waders, you name it. A warm up is coming though. After Monday 1/21 and Tuesday 1/22 we will get about a three day reprieve of decent fishing weather before the next cold shot arrives on Saturday 1/26. It will be a lot like the past cold blast. It looks like mid week or Wed, Thurs, and Friday will offer a good shot at getting out fishing. To anyone interested, I have availabililty on those days. The one that got away because Jeff dropped it….it was huge…. Great Week’s End Wade Fishing…..
Sunday, January 13, 2019…. Great and wade fishing, bet you haven’t heard that from me in a while. Actually you definitely haven’t. But I mentioned that we were headed in that direction and that while the water was high, and chilly, that things were improving steadily and we had red hot fishing ahead. Cold hands, feet, ice on the rod, ice in the guides, and lots of fish. Lots. Several 20 inch plus fish. Several. That is exactly what longtime client David Carter and his son Adam had with me on our Friday wade fishing trip before the winter storm blew in. Temps to start were in the low to mid 20s, it was frigid. As I mentioned above, Ice in the guides, on the line, cold feet, cold hands, and red hot fishing. We did very well. Met the guys early and we did a wade trip, we arrived mid to late morning to give the sun time to get things moving. We caught fish right from the outset. The water was high and chilly, and green like I love to see it, and the fish were more than cooperative. Actually, the nymph fishing was on fire. We lit em up on double nymph rigs, and landed probably 4 dozen rainbows, three of which were in the 22 to 25 inch range. Pigs…. The stonefly emergence is in full swing, and small dark patterns are catching a lot of fish as they should be. There are a host of smallish dark stones that hatch this time of year, collectively known as “little winter black stones”. There are several species of these, Allocapnia, sp., Amphinemura, sp., Leuctra mitchellensis, Sweltsa mediana, Neoperla clymene, Amphinemura nigritta, all contribute to this activity my entomologist friends tell me. 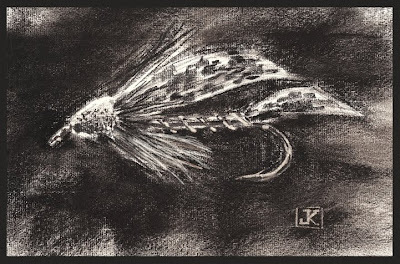 They are often called ‘sallflies’, ‘snowflies’, ‘willowflies’, among others. The trout do notice them though, and at lower water levels we can fish dries to them. 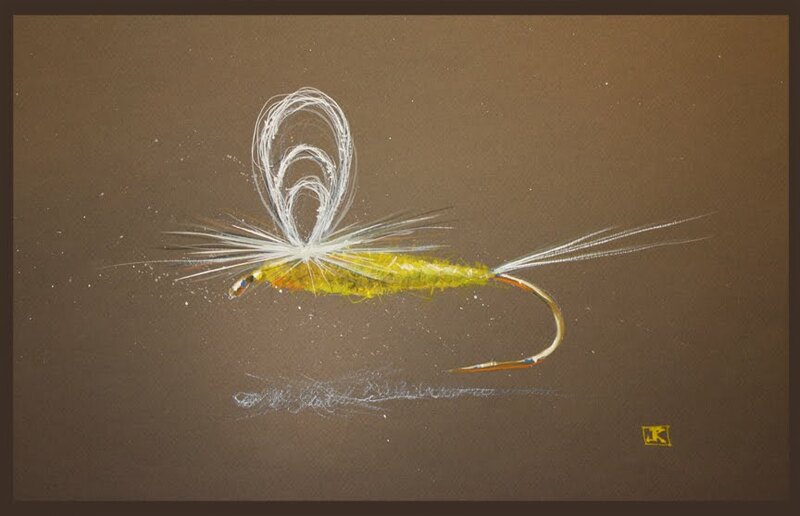 A great fly is a Griffith’s gnat size 18 and 20 with the hackle trimmed flat on the bottom. Right now, the water is high making the nymph imitation a better option. They are size 18 and 20, and can often be seen crawling on the banks or on ice and snow. The fish love them, and you should too. You should have some in your box regardless of where you are fishing, they are great tailwater flies, small stream flies, and great for Delayed harvest and Hatchery supported waters. Patterns that imitate these are black copper johns, Skinny Nelson, Slim Shady, black pheasant tails tied skinny, etc. We fished them yesterday all day, the rig consisting of a larger point fly (Y2K, Sucker Spawn, Bead Egg, Dirtsnake, etc.) and the small dark stone pattern as a dropper. 85% of our almost 50 fish ate the small dropper fly, even in the high flow. Two of the three big fish ate the tiny fly. Can they see the tiny fly in that much water? You be the judge. We fished til 130pm, had a nice hot shore lunch in the sun on the riverbank, then fished til about 415pm and called it a day. This fishing will be great this week as we had minimal impact from the weekend’s ice and snow and rain and its going to be game on. Best part of it? We fished all day and not another soul on the water….had the river to ourselves. Today is solid proof that cold weather impacts fishermen more than fish. If you want to catch some fish and kill that cabin fever right now is an excellent time to do it, and both wade and float options will be good. Small streams are fishing good, all the way around. The water is down to a fishable level and clear, green clear, the type that makes for excellent nymph and streamer fishing. The tailwaters are still blowing high flows, 3000 plus on the South Holston and 2400 – 2600 on the Watauga. Big water yes, but the fishing has been excellent. We have caught lots of fish on higher flows and some big browns throwing the big stuff. Projections show this higher flow continuing, in other words, high, steady, stable flow. Stable conditions, especially high and stable, often produce remarkable fishing. The longer the river stays deep and swift the more fish stack up on bank structure, eddies, inside gravel bars, tops of islands, tailouts, seams, you name it. Big fish feed and grow in these conditions, and are very receptive to meaty offerings like worms, nymphs, baitish, and large, full profile streamers. But you gotta go to get in on it. Going to be a great week and I do have a couple days that opened up, the most recent weather had almost zero impact from a negative standpoint in affecting water levels so its going to be a good week to fish. Highs most days will be in the mid to upper 40s F so good in that respect. Let’s go fly fishing! Some of my favorite big meat flies for large fish, all chewed up of course….. my Double L’ streamer ( Locked n Loaded, top), Tommy Lynch’s famous Drunk and Disorderly (middle), and Bunny strip leadeye crayfish (bottom). These flies in various colors have put almost 60 20 inch plus browns in my boat over the past month and a half. Fri. January 11, 2019 – At least that is the word for now, wade fishing is steadily improving with a few days of dry and mild weather. I guess we went a whole week without significant, measurable rain. We may be in a drought situation. Just kidding, of course. Don’t worry, we have more on the way. A Winter storm watch which will include a mixed bag of snow, sleet, and freezing rain. So if you were worried we were slipping into drought conditions, take heart, we are fine…..lol. On Thursday I guided a wade fishing trip, Dr Pat Burney, Dr Ken Karb, Greensboro, NC, and it was cold, quite chilly after the mild weather we had for weeks. The guys wanted to do some wade fishing, and close to home if possible, and so we did just that. Water is up everywhere, and that’s not all bad. Lots of new holes and runs in your favorite streams I can guarantee you. We wade fished and got in the water mid morning, the water was high and relatively clear, “green like money” as I call it in the winter. Fish the green and make some bank, that is catch some fish. Right now, as is normally the case in winter, slower areas of the river, seams, seam eddies, deep bends, deep tailouts, slower pockets within runs , that is where you are going to catch fish right now….and that is exactly what we did…fish those spots. It was a little slow to start, which I expected and you should too, but we caught a few in the morning and from midday til we quit around 4pm we had steady action landing a bunch of fine rainbows. Ken had the largest with a 20 inch plus rainbow. I expect we caught a couple dozen total, which I was real happy with and so were the guys, and particularly since we have had such limited wade fishing opps the past month. Junk patterns teamed up with a tiny nymph (pick a fly, a midge, a small stone, small pheasant tail, brassie, etc) worked well, as they should. Takes were split half and half, with the hottest fly a Y2K in watermelon and flo peach. We fished til 4pm and called it a day. Good to do some wade fishing, we’ll be doing more this week. I will be doing a wade fishing trip tomorrow (Friday) with David and Adam Carter, Greensboro, NC, and it will be nice to do more wade fishing. Looks like a mixed bag weather event coming for the entire area. I have a Saturday open but I suspect I’ll find no one willing to do some fishing. I had a potential float trip scheduled but we opted to postpone due to the threat of ice being a part of the mix. This time that is highly likely. Snow? If it were snow, business as usual. I’ll tow the boat or wade fishing up to and over a foot of snow on the ground. That’s no problem. Ice…? That is a different deal altogether and not something to mess around with. Enjoy your Friday, have a great weekend. Might be a good time to catch up on your fly tying…. New Week, Same Story, Big Water and Big Fish…..
Tuesday….Jan 8, 2019 ….. This week started off where last week left off. Big water, 3010 cfs…..and big fish. Multiple 20 inchers in the boat today. On Tuesday I did a guided float trip, with David Slaydon, of Reidsville, NC, and Bob Stanford, of Greensboro, NC. We have continued to have big flows as its continued wet patterns goes on ….but we had a few dry periods….even if we kept the ‘we got rained on ‘ mantra going into 2019. We did get a few periods of showers , enough to soak us and then it quit. Bob Stanford with a hog brown on a tiny Zebra midge. Big fish, tiny flies, in big 3010 flows. Bob and Dave and I did the entire South Holston to Bluff City, the ‘Long day’ so to speak. We floated the big water, 3010 cfs, as TVA still dumping lots of water to get the lake back to where it should be. Not a lot of folks on the water, we saw one boat and they were floating and duck hunting. We mocked the weatherman and put several 20 inch plus studs like this in the boat. Fishing wise we had the whole river to ourselves. The weather was mild, cloudy, periods of rain, and we got some windy conditions later in the day as a potent front blew in late in the day. We caught a lot of fish early nymphing, we nymph fished the first third of the trip and caught some fine fish, the best one a fish of 22-23″ Bob landed on a Zebra midge. Bob Stanford with one of the prettiest browns in the boat, great way to start the new year off right. 20 inch browns…..gotta love it. Take note, the river is up in the trees…. Pretty impressive as we hooked up and pulled anchor and followed the fish downstream and netted it. Sometimes hard to keep large fish on lighter tippet in heavy flow with a smaller fly like that. But we got the fish in the boat and snapped a couple quick photos and released the fish. Halfway through the float we got out the big rods and decided to commit to streamer fishing the rest of the way. Keep them coming…..its been a great high water fishing foray the past few weeks. As I usually say, put in the work and reap some rewards. That is exactly what it was…..the guys committed to it and hammered out a good afternoon throwing meat, and put several big fish in the boat. Some of the most epic streamer eats with fish hammering the fly in a boil a foot under the surface. “Slay” with another transitional water brown. Had several like this, including a violent kill shot delivered by one of the best fish of the day, a gorgeous two footer that Dave got within 200 yds of our takeout. It was a crushing strike , or arm jolting eat, a move by a fish not going to be denied a great meal. We took a couple pics , released the fish and watched as it bolted away. We arrived at our takeout at dark. Great day, two great guys, its always a blast …. High water can be good to you if you let it be…..
Dave “Slay” with a nice brown that ended the day right at the takeout. This just further proves what I have been harping on for what now seems like an eternity. That is, you have to accept less than perfect conditions, put in the work, go anyway, and give it a full on effort. The past year has been, and the coming year will be too, one of those years where if you don’t go anyway and forget the weather causing issues then there’s a good chance you won’t be fishing. It rained on over 70% of my trips last year. That is, not drizzle, not showers, measurable rain. Downpours, thunderstorms, hurricanes, I mean flooding rains. Snow, wind, hail, you name it we fished in all of it this year. More is coming. This year won’t be any different. If you want to fish and catch fish, you are going to have to go anyway……I say that whether its on a guided trip with me or on your own. My wife Kathy with one of over 100 fish we landed in 4 hours dry fly fishing a sulphur hatch in a pouring rain in May 2018. We have been blessed with great fishing despite the weather. All these fish are just a few of the many that were landed when folks took my recommendation, forgot the forecast, mocked the weatherman, and went anyway. Proof is in the results…. Have some wade trips coming up and then a float at the end of the week if the upcoming winter snow doesn’t turn out too bad. Of course, we’ll probably take that one head on and keep fishing. The wade fishing is possible again now that our rivers have calmed down a bit. We used Sawyer exclusively, they make great stuff! Jan 5, 2019 …..Wet, Wet, Wet, that is the continued theme. But we have a wet weather game, and its been really good. And if getting out fishing anyway is what your thoughts are turning to, take heart. We have been doing well, and catching a lot of fish despite the perceived “tough” conditions. For fish its business as usual, and lots of water isn’t unusual, undesirable, or unworkable for them. They thrive in it. You can too….want to fish? Message us and we can make it happen…. But the reality is, it has been wet. How wet? Wettest ever for most of the area. Never wetter. If you make extreme statements like “man, its never been like this”…..and “I have never seen it this wet….”….. this time you are right on the money. Below is a list of locations and precip totals for 2018. For every location it was the wettest in history of keeping climatological records, which dates back over 100 years, unless of course there is a parentheses…in which case the rank of wettest year is in that. Wet weather is a hassle, and an inconvenience, and a game changer. But you can still do well. And, it does not harm fish. They thrive in it. Bugs do well in it. Streams get cleansed, fresh nutrients are brought in, and that is great for the bugs which in turn provides food in great abundance. It is NOT the catastrophic or bad deal it is made to sound like. Perhaps most of all, its NORMAL. We have always had wet weather, we have always had and will always have flooding. Best way to look at it? Learn to deal with it. Develop new strategies…..learn some new techniques. Stretch your skill set. Its all good. You will learn some tricks you can employ for the rest of your angling days. With all that said, here is a synopsis of the week for us, right on the heels of a great New Year’s day float trip with Anthony Hipps and Paul Gruver. On 1-2-2019 I had scheduled a guided Trip with Curtis and Nathan Reeves, Archdale NC. We had planned a wade fishing trip, and decided to postpone and reschedule as water was still a little higher than I prefer. For wade trips we are just giving it an extra day or two to drop. We postponed and will be rescheduling to another day. On 1-3-2019 I did a float trip with one of my frequent clients Ted Linczak, Summerville, SC, we ended up doing a South Holston float trip and had a killer day streamer fishing. We fished the big water , 3020 + cfs , fished the big rods and the big stuff and landed about 25 fish, including several 20 inch fish. The river was up and rolling but it didn’t stop us from having a good day. Put in the work and the time, and you get rewarded. We forgot the forecast, mocked the weatherman today and won. Great day though, fishing was good even with record flows. Here are some pics…. On 1-4-2019 I guided Joe & Ian Craig, High Point, NC, we did a TN tailwater float, put in mid morning, flow was 3020 cfs, big flow, I knew we’d be able to drum up some fish nymphing, and we did just that. Water was up even above full sluice flow of 3020, and a little dingy, but we still did well. Forecast was for all day rain, and we had heavy rain overnight and in the morning but then things settled down a bit and we had a mostly dry day. Even a few peeks of the sun…..we caught fish on nymph rigs, double nymph rigs, caught a lot of fish on midge patterns in the huge flow. Fish can see better than you think they can….pretty amazing still they can find and pick out a tiny fly in so much water. We landed probably three dozen or so fish nymphing, then found an eddy 3/4 the way through our float where there were some rising fish. Nailed the first 3 dry fly fish of 2019. A pretty amazing river when you can catch dry fly fish in the dead of winter, incredibly high water, and its January. After catching fish on dry flies the guys wanted to head downriver and try their hands at throwing meat. Big rods, big flies, 300grain lines, and lots of slinging. But , as I always say, if you are willing to work for it and put in the effort and time, sooner or later it gets rewarded. The last mile of the float we got three fish to eat, all nice fish, two of them over 20 inches. Fishing has been good……simply good …..do we really care anymore if it rains? Nope. Here are some pics…..
Its been a great week, to put it plainly. Looks like more wet, then our next cold shot arrives Wednesday. Water will be shaping up for some wade trips, and of course, floating is always an option. You want to catch some fish, mock the weather, go anyway and have a great time then let’s git er done. Happy New Year 2019…. Its Winter and Wet Continues…. Jan 2, 2019….. 2018 circled the drain and is under us and what a wet one it was. Historically, it was the wettest year on record for the Appalachian region. Not even close to any other year….1973 was a really wet one, but 2018 is the wettest year since climate records were first kept over 100 years ago. So how wet was it? According to the TVA, the Tennessee Valley was the wettest ever with a basin average of 67.1 inches of rain. Previous record was 65.1 inches in 1973. Mt Mitchell, NC, the highest point east of the Rocky Mtns in the West, got 118.80 inches. Nothing even close enough to compare that number to. Its been wet, real wet. On our trips, we got at least some rain on roughly 70% of them. I cancelled almost 60 dates due to flooding, rain, some weather related stuff, missing large chunks of time. We , for the first time I can remember, missed an entire season of smallmouth fishing because of bad conditions. And yet, in many ways where we fished we had the best fishing I have ever experienced. Sulphur hatches that were beyond mind blowing. Best dry fly fishing on the tailwaters I can ever remember. Epic streamer fishing that produced more 20 inch plus browns than you could count. Simply, if you could put up with the inconvenience of less than perfect weather, grabbed the raingear and fishing gear and went anyway, you were almost always rewarded with an incredible day. I lost count of the 75 to 100 fish days on the tailwaters. With the sluice flows on both rivers, we had the best dry fly fishing I have ever experienced, both personally and on guided trips with clients. It was the best. Ever. So what is 2019 going to be like? Well, short term, its more of the same. Started wet, and we have more rain in the forecast for Friday. Potentially some 1/2 to 3/4 inch stuff. What does that mean? More great fishing where you can get on the water. Simply stated, if you want to fish you are going to have to forget , in the short term, about those perfect sunny , warm , blissful days and take the hand you are dealt. Grab the raingear and go make some bank. You might be surprised how good the fishing is….. Want to enjoy good fishing and few other anglers? As Nike would exclaim….Just do it. On New Years day I guided Paul Gruver, Raleigh, NC, and Anthony Hipps, Lexington, NC, on a float trip on the South Holston River. I know its hard to believe but there was a big rain before the guys came up, and a big rain overnight but it didn’t stop us from fishing. Even with higher flows on both South Holston and Watauga we are fishing. I assured the guys we would still do just fine. High water on tailwaters means ‘normal’, business as usual kind of stuff. I told them, no worries, we’ll still catch fish. And we did just that. Except for a brief spell of tossing a streamer, we nymph fished different double rigs and double rig combos and did really well. Caught a good mix of rainbows and browns, up to 15/16″ or so. I did not keep count but Paul and Anthony put probably between 40 and 50 in the boat, a good day anyday. Normal “high releases” are usually in the 2200 to 2400 range during normal generation or high flow sluicing. Today’s flow was 3020cfs, and probably more like 3300-3500 given some of the extra inflow from feeder tribs. So, does high water eliminate the fishing? I’d say between 40 and 50 fish didn’t say that it did, let alone the two dozen or more that were briefly hooked that came off who didn’t get to speak on the matter because the fight ended early. Add those in and an already great day becomes an epic day. So, again, does high water eliminate the fishing? Bottomline is if you desire to get out of the doldrums, go catch some fish in this historically wet period instead of waiting for what is “ideal conditions” (which isn’t how the fish define ideal) …. its a call, text, or email away. You know, just like Domino’s Pizza…where “one call does it all”. But we don’t supply Pepperoni. Wait, if you want to go fishing and Pepperoni would seal the deal then I’d be more than happy to bring it. We have a ton of trips coming up. In keeping with the first of the month every month we make available a printable fly chart and fly recommendations for area fishing. Click here or click the image below and it will take you to a link where you can access and print a January Fly Hatch Chart. Hope your 2018 wrapped up nicely and I wish you a happy, healthy and prosperous 2019.